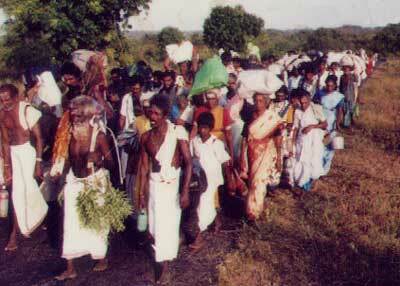 On June 11, 1990, hundreds of devotees began the 45-days Pāda Yātra from Mullaitivu to Kataragama. However, the outbreak of fighting on that very day resulted in the disruption of the pilgrimage. Although some pilgrims kept trying for as long a four weeks even under war conditions, nearly all had to turn back and did not reach Kataragama at all. In 1991, despite still unsettled conditions, hundreds more including a few western pilgrims joined the annual Pāda Yātra. Senior devotee Sella Swamigal, who formally accepted the emblematical Vēl or lance from retiring Pāda Yātra master Muttukumar Vel Swami, led the advance party from Varrāpalai Kaņņaki Amman temple on May 28. As late as the sixteenth century, so many Muslim bāwās and Hindu swāmis used to come through Jaffna on their way to Kataragama that the Portuguese colonial authorities, fearing a covert threat to their regime, decided to seal off the ancient pilgrimage route from the Asian mainland. The Katira Malai Kārai Yātirai or 'coastal pilgrimage to the Shining Peak' has thus at times passed into onscurity but has always managed to survive over the centuries down to the present day.  In the 1970's the annual two-month walk from Jaffna to Kataragma used to attract over thousand of the faithful from Jaffna alone who would fill every village along the way with cries of Harō-Harā!, the hallelujah chorus of Kataragama devotees. But ethnic disturbances brought favourable conditions to an abrupt cessation in 1983 with acts of violence upon Pāda Yātra pilgrims. In 1988 the newly formed Kataragama Devotees Trust rallied national support and recognition for the few brave devotees who answered the call of veteran pilgrim Vel Swami (72) for devotees to resume the ancient tradition. In 1988 and 1989, pilgrims managed to walk from Mullaitivu to Kataragama even in tense and often dangerous 'peace' maintained by the Indian Peace-Keeping Force under the terms of the 1987 Indo-Sri Lanka Peace Accord. But in 1990 with the departure of Indian troops open warfare broke out on the very day (June 11) when the Pāda Yātra also began. Minefields and battle zones blocked every route for mostly, the elder pilgrims, and eventually all had to turn back, each left to ponder the mystery of their Lord's strategy. The spiritual legacy of Kataragama has always been passed down in the form of the participants' own inner illumination (katir) and delight (kāma), assuming many humble guises along the way just as the Pada Yatra pilgrims still do. No one to this day - whether Sri Lankan or foreign - has ever plumbed the full depth of Kataragama's wellspring of spiritual life. But many are quietly exploring it for themselves. Patrick Harrigan, M.A. (U-Michigan, 1984) has been acting editor of the Kataragama Research and Publications Project since 1989 and webmaster of www.Kataragama.org since 1997. The 2002 Kataragama Pada Yatra was his sixteenth walk since 1972.